Whooping cough (pertussis) is a highly contagious bacterial infection of the lungs and airways. Whooping cough is caused by a bacterium called Bordetella pertussis, which infects the lining of the airways, mainly the windpipe (trachea) and the two airways that branch off from it to the lungs (the bronchi). People with whooping cough are infectious from six days after exposure to the bacteria to three weeks after the “whooping” cough begins. The bacteria is passed from person to person by infected droplets in the air, spread by coughing and sneezing. The symptoms of whooping cough usually appear around a week after infection with the bacteria. But this delay – known as the incubation period – can last up to 21 days. Whooping cough tends to develop in stages, with mild symptoms occurring first, followed by a period of more severe symptoms, before improvement begins. These early symptoms of whooping cough can last up to a week, before becoming more severe. The second stage of whooping cough is often called the paroxysmal stage and is characterized by intense bouts of coughing. The bouts are sometimes referred to as “paroxysms” of coughing. Each bout of coughing usually lasts between one and two minutes, but several bouts may occur in quick succession and last several minutes. 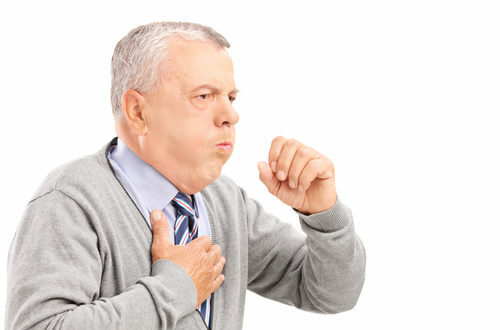 The number of coughing bouts experienced each day varies, but is usually between 12 and 15. The paroxysmal symptoms of whooping cough can last a month or more, even after treatment. This is because the cough continues even after the Bordetella pertussis bacterium has been cleared from the body. Infants younger than six months may not make the “whoop” sound after coughing, but they may start gagging or gasping, and may temporarily stop breathing. Though very rare, it is possible for whooping cough to cause sudden unexpected death in infants. Young children may also seem to choke or become blue in the face (cyanosis) when they have a bout of coughing. This looks worse than it is, and breathing will quickly start again. In adults and older children, the paroxysmal symptoms of whooping cough are usually less severe than in young children, although the cough may still last for several weeks. Eventually, the symptoms of whooping cough gradually start to improve, with fewer and less extreme bouts of coughing occurring. This period of recovery can last up to two months or more. However, intense bouts of coughing may still occur during this period. Immediate consult with the medical practitioner must be done if suspecting whooping cough. Diagnosis is usually done by asking about symptoms and listening to the cough (the whooping cough is very distinctive). Whooping cough can be severe in young babies and, in some cases, they may need to be diagnosed and given immediate treatment in hospital. Whooping cough is usually treated with antibiotics at home. Young babies (less than a year old) with whooping cough may need hospital treatment to avoid developing complications. Children admitted to the hospital, are usually treated in isolation. This means they will be kept away from other patients to prevent the infection spreading. Intraveous antibiotics, or medications being infused directly into the vein, are given. Corticosteroids may be given alongside to reduce inflammation (swelling) in the airways, making it easier to breathe. Like antibiotics, corticosteroids may be given intravenously. If assistance with breathing is necessary, they may be given extra oxygen through a facemask. A handheld device called a bulb syringe may also be used to gently suction away any mucus that is blocking their airways. If these measures fail, the baby may need extracorporeal membrane oxygenation (ECMO). This is similar to a heart-lung bypass machine and delivers oxygen into the blood. The condition tends to be much less serious in older children and adults and can usually be treated at home with antibiotics and self-help measures. If whooping cough is diagnosed during the first three weeks (21 days) of the infection, a course of antibiotics will be given by your doctor to prevent the infection spreading. Antibiotics will stop you from being contagious after five days of taking them. However, without antibiotics, you may still be infectious until three weeks after your intense bouts of coughing start. If whooping cough is diagnosed in the later stages it’s unlikely for antibiotics to be given and symptoms will not change. Whooping cough is highly contagious, it is important to stay away from others until the infection has completely cleared. The affected person should stay at home until they have completed a five-day course of antibiotics, or had intense bouts of coughing (paroxysms) for three weeks (whichever is sooner). Although bouts of coughing may continue after three weeks, it is unlikely you’ll still be infectious. Preventative treatment is also usually recommended if a household member works in a healthcare, social care or childcare facility as they could pass the infection on to other vulnerable contacts. Preventative treatment usually involves a short course of antibiotics, and in some cases, a booster dose of the vaccine.